But it is not just the palaces. 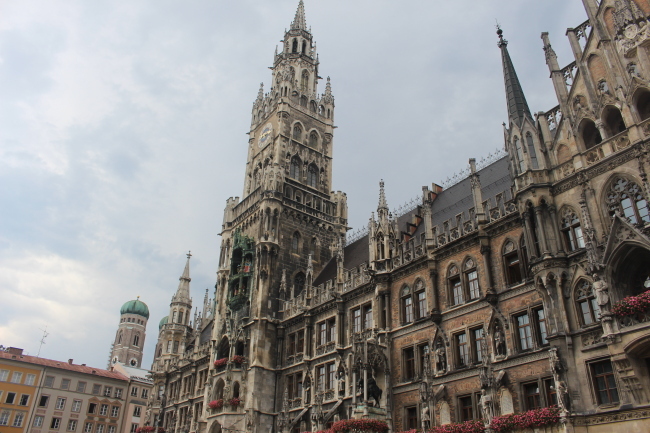 The town of Munich and Bavaria exude an atmosphere of stepping into a storybook, with each street, building and location offering a story of its own. 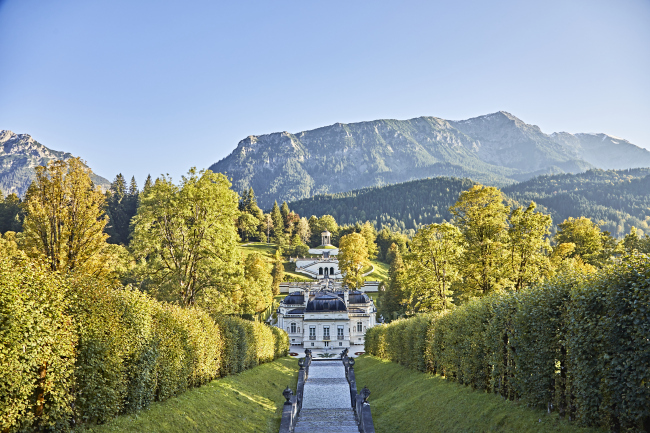 The three palaces that Ludwig II built still stand today and traveling westward from Munich, you will be able to see the only one of the three palaces that Ludwig II lived to see completed, Schloss Linderhof or Linderhof Palace. 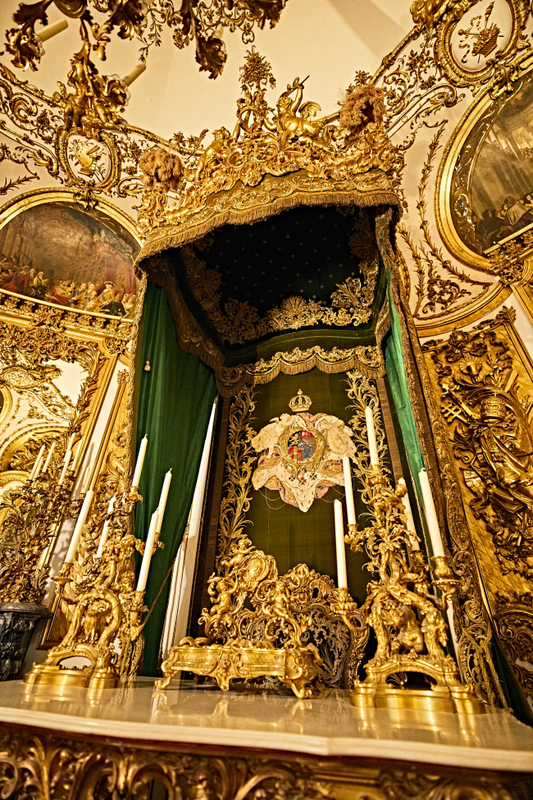 The palace is not grand in scale, but its lavish style and artistic interior suggest the life of the storied king. The gold-plated decorations are a little bit faded, but just a quick look inside Ludwig’s safe haven is enough to leave you in awe. Walking up the golden staircase, one comes across the West Tapestry Chamber, also called the Music Room. An ornamental peacock stands in solitude, having retired from its task of alerting outsiders to the king’s presence by being placed outside the gates. Portraits of Ludwig II’s heroes, France’s Louis XV and Louis XIV, the Sun King, hang over the two fireplaces in the room. Ludwig II is said to have seen himself as the Moon King, a romantic shadow of the absolute ruler of France. His affection for Louis XIV can be found all around the palace in the form of sun symbols. 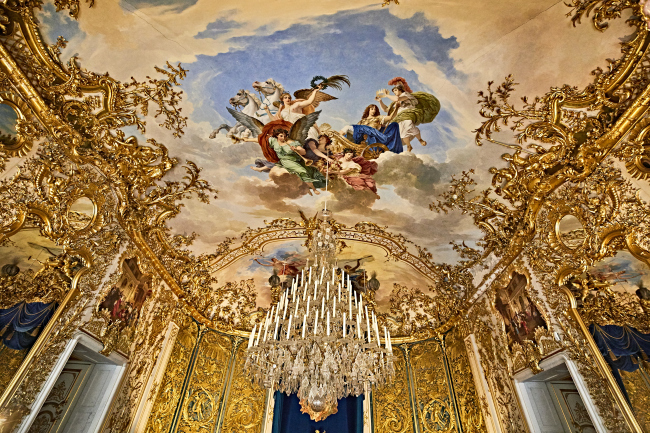 While the absolute power that the French kings enjoyed no longer existed in Ludwig’s time -- Ludwig II was a constitutional monarch -- the building replicates the Rococo style of Louis XV’s time. Beautiful decor notwithstanding, the room had little use as the introvert rarely received guests. His sleeping chamber houses a gigantic bed that his towering 191-centimeter figure rested in, but the dining room is where Ludwig’s personality stands out. The room has a table that would be lowered into the kitchen for his servants to set the table, and elevated back again for the king to enjoy his meal in solitude. Actually, Ludwig II may not have been alone at all as he was said to enjoy entertaining Louis XV, Madame de Pompadour or Marie Antoinette in his imagination while he dined. The Hall of Mirrors is where he enjoyed sitting, sometimes reading the night away as he spent most of his days sleeping. The mirrors that surround the room still create a fantastic illusion today, as one is left to imagine what the king would have seen as he sat there alone. 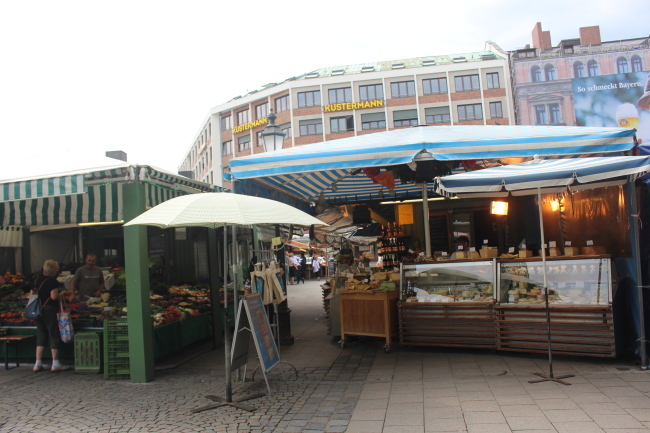 Munich is an odd place: Nearly 1.5 million people reside in it, which theoretically makes it a bigger city than San Diego, Dallas, Boston or even San Francisco, if you can believe that. But walking around it feels like a stroll in a small suburban town. The bell clock chimes daily at designated times, and the kinematic arrangement of the machinery allows the figures to emerge during designated times, which varies depending on time of the year. Not far from the town hall is St. Peter’s Church. 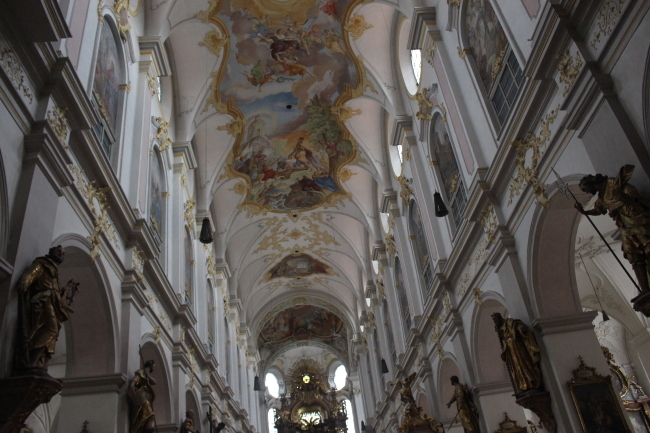 Upon entering, be sure to look up to find the story of St. Peter inscribed in the ceiling. A famished stomach can be satiated with a visit to Hofer Der Stadtwirt, one of the oldest restaurants in the city. It is so old that one may have trouble finding wireless internet connection there. Try the schnitzel and beer. Actually try beer in any German eatery you stumble across. Neither the awards the hotel received, nor the comfy rooms are the selling point of this hotel. It is the odd little shrine to Michael Jackson set up in front of the hotel, where the King of Pop would stay during his visits to the city. The funny thing is that it’s actually a statue of someone else, Renaissance composer Orlando di Lasso. Despite the scuffle with city officials who wanted to get rid of it a few years ago, the place is still littered with loving memories and tributes to one of the greatest musicians that ever lived. So what is it like, the hotel that pulled in Jackson? The hotel itself is a beauty. It is known for hosting events like the Munich Film Festival 2018 that ended earlier this month, and its Blue Spa lounge offers a pool with a sliding glass roof, gym, along with treatment and massages. It is quite something to work out on the balcony with a beautiful view of the city just outside. Palais Keller has some nice Bavarian classics, while three Michelin-starred Atelier with Silent Garden has some seasonal creations. Located on the ground floor is a movie theater, a comedy theater, a piano bar and a night club hosting jazz performances. 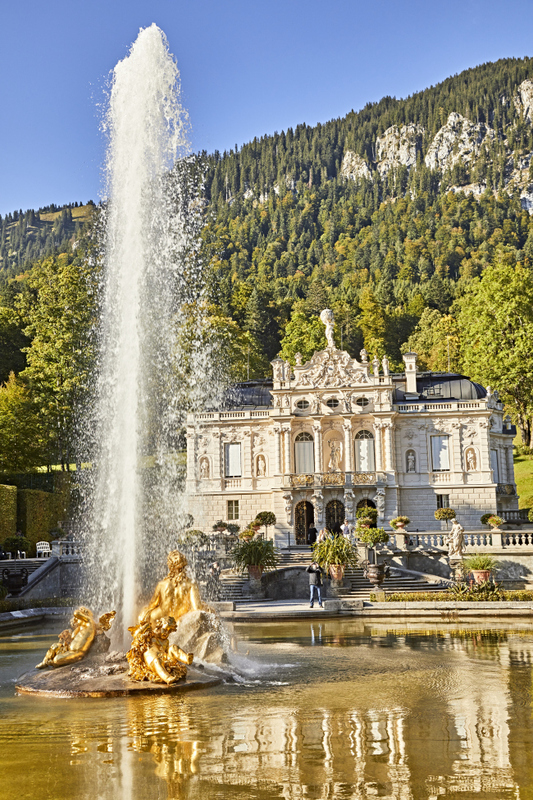 Speaking of artistic influences, the footprints left by Ludwig II’s grandfather Ludwig I are not to be overshadowed by his eccentric descendent. 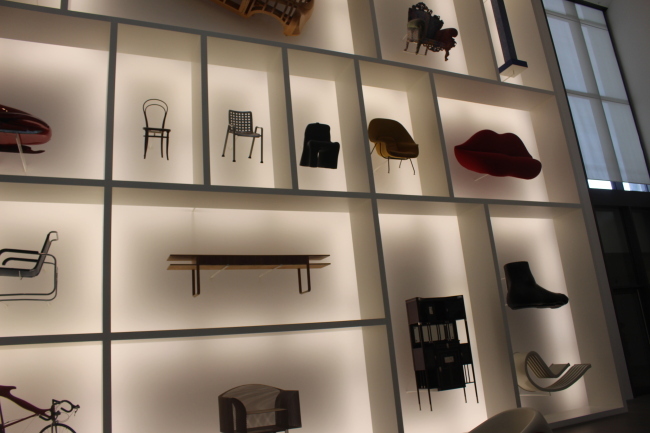 Pinakothek der Moderne, opened in 2002, has a collection of modern art, industrial and applied arts, works on paper, and architecture.